Oceans have been absorbing more of global warming’s heat and energy than would normally be expected, helping to slow rates of warming on land. But how long will that last? January 29, 2015 — Probing a blue abyss can be an abysmal recipe for the blues. For every 10 joules of energy that our greenhouse gas pollution traps here on Earth, about 9 of them end up in an ocean. There, the effects of global warming bite into fisheries, ecosystems and ice. But those effects are largely imperceptible to humans — as invisible to a landlubber as an albatross chomping on a baited hook at the end of a long line. What scientists discovered in 2014 is that since the turn of the century, oceans have been absorbing more of global warming’s heat and energy than would normally be expected, helping to slow rates of warming on land. What they will be talking about in 2015, and beyond, is when that trend might come to an end — likely following a routine shift in Pacific Ocean trade winds. Much of that extra sunken heat will eventually be belched back into the atmosphere by the overheating seas. The effects of ocean warming might be imperceptible to most of us, but they are far-reaching. They are driving fishing fleets further out to sea, ushering tropical fish into polar waters, and worsening flood hazards for coastal communities. 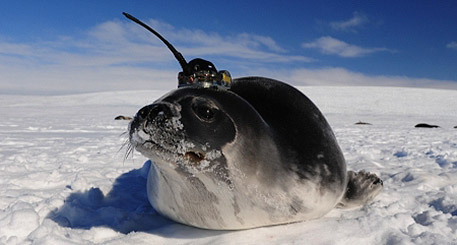 A Weddell seal with a conductivity-temperature-depth tag on its head. Credit: Dan Costa, University of California at Santa Cruz. It can be difficult to probe the ocean, but it doesn’t help to look away. So scientists have been finding innovative new ways of peering beneath the swells, conscripting everything from seals to climate models to improve their grasp of marine temperature trends. Titanic international projects that are just kicking off, including the National Science Foundation-funded Ocean Observatories Initiative and Southern Ocean Carbon and Climate Observations and Modeling project, promise to pile on reams of new data and knowledge in the coming years — not all of it expected to be postcard pretty. Many of the discoveries from similar research during the past year were decidedly feverish. During 2014, as rising ocean heat fueled planetary temperature records, and as it continued to eat away at Antarctic ice, scientists discovered that the oceans have been warming far more quickly than anybody had realized — and doing so for decades. 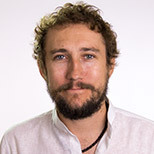 Stark findings were published online in Nature Climate Change in October, relying on data from the global flotilla of thousands of Argo floats. These drone-like seafarers have been plumbing inhospitable depths since 2000, beaming back data on ocean temperatures and other variables. Using float data, scientists recalibrated sparse historical measurements and estimates of ocean warming, concluding that the upper 2,700 feet of the world’s oceans had warmed by between a quarter and a half more than had previously been realized. The largest discrepancies with existing data were discovered in the Southern Hemisphere, where historical records are as sparse as the shipping traffic that traditionally provided so much of the planet’s ocean weather information. There, it appears that ocean warming has been occurring at twice the previously-understood rate. As seas continue to swell, flooding cities and infrastructure, they’re also going to continue to become more acidic. The impacts of ocean acidification, which is caused when carbon dioxide dissolves into seas and reacts with water, is a topic that scientists and governments are only just starting to grasp in meaningful ways. With task forces and research projects being launched across the globe, 2015 promises more answers not only on ocean warming, but on the shellfish-ravaging and fish-baffling effects of falling pH levels. This article was originally published by Climate Central and is reprinted with permission.